Australian engineers might have solved one of the biggest obstacles to scaling up solar energy — the lack of affordable storage technology that allows solar to be used at peak demand after the sun goes down. Their California-based startup Terrajoule is applying an older technology, namely steam engines, to build a storage system that could lower the cost to under $100 per kWh, which is less than 20 percent of what it costs for current battery storage systems. This new system will also last longer (it has a 25 year lifecycle), thereby eliminating use of the toxic and rare materials contained in batteries. The company believes they can use steam engines quickly and cheaply scale up solar, because all of the necessary technology already exists in automotive and industrial supply chains. This means that the factories, materials and manufacturing equipment can be easily converted to solar storage use. Terrajoule recently announced they received an $11.5 million Series A round of funding that will allow them to continue to scale up distributed solar power generation. “Who expected that reciprocating steam piston engines would play a major role in 21st century energy growth?,” the Terrajoule website states. 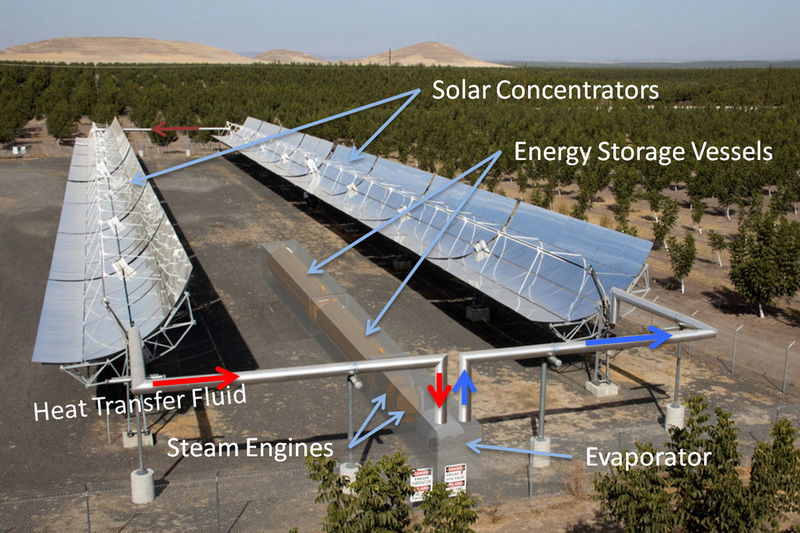 The principle of concentrated solar power (CSP) plants is simple: curved sun-tracking mirrors capture sunlight and concentrate it on a solar receiver tube. 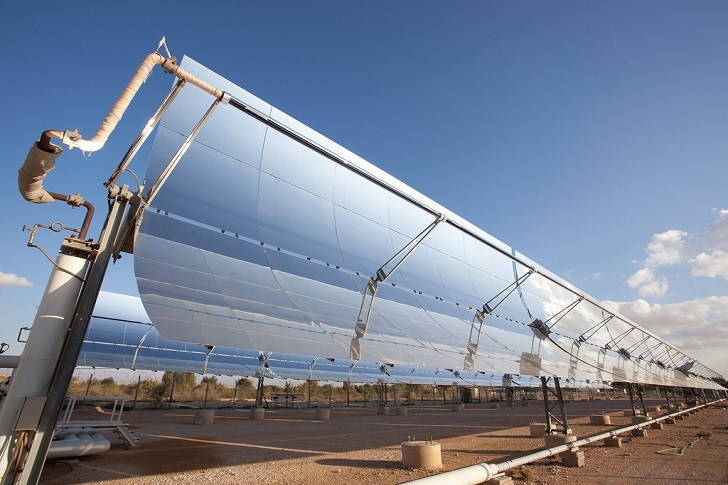 A transfer medium, mainly oil, flows through this tube, and is heated by the concentrated solar radiation. This medium transfers its heat to water, generating steam. The steam drives a turbine, which then drives a generator. Finally, the generator produces electricity. While the technical principles of CSP were established a long time ago, the current challenge is enhancing plant efficiency. Experts expect that CSP plants could be economically competitive within 15 years, allowing the gradual phase-out of subsidies for electricity generated in these plants. Das Grundprinzip von Solarthermie-Kraftwerken ist einfach: Parabolspiegel konzentrieren das Sonnenlicht auf sogenannte Receiverrohre. Durch diese fließt ein Transfermedium, in vielen Fällen Spezialöl, welches sich durch die Strahlungseinwirkung erhitzt. Diese Wärme wird in einem Wärmetauscher auf Wasser übertragen, das dabei verdampft. Der Dampf treibt wiederum eine Turbine an, deren Leistung in einem Generator in elektrische Energie umgesetzt wird. Das technische Prinzip hinter der Solarthermie ist seit langem bekannt; die aktuelle Herausforderung besteht darin, ihre Effizienz zu erhöhen. Experten rechnen damit, dass die Technologie binnen 15 Jahren ökonomisch wettbewerbsfähig werden könnte. Subventionen für solarthermisch produzierten Strom könnten damit Schritt für Schritt verringert werden. Australian engineers are taking an older technology -- steam engines -- to build a storage system that could lower the cost of solar to under $100 per kWh.